So, we’re now at that strange time in the year when the days are getting shorter, the sun doesn’t seem to want to make that much of an appearance and we are forced to start covering up again. I personally prefer summer to autumn and winter and I always will. It’s nice to be able able to wear bright and garish colours, bold prints and show a little skin. Having said all of that my aim this year is to have a little fun with my warmer wardrobe. Cute hats, scarves and funky adornments might be the way for me to go when it comes to adding that extra style and flair to my sense of dress this winter. I hate to say it but I have now had to start wearing my jackets and jumpers and other winter warmers. I think it’s fair to say that summer is pretty much over and any day of sunshine and heat we get we’ll need to make the most of! I was going through my clothes when I started to feel that sudden chill in the air and I dug out this gold studded jumper from Primark that I purchased last year. I initially bought this when I was looking to add a little sparkle into my wardrobe. This size 20 jumper is really spacious and is just the right length to cover my behind. The thing I like about items with bold prints or with adornments is the fact that they become the focal point to the outfit. Often they can take away any need to accessorise or they can help you in the selection process. I really enjoy the dusting of gold studs I think it brings an element of fun to an otherwise simple piece. I like keeping it simple sometimes and I thought it would be cool to pair this jumper with my wet-look leggings from Scarlett & Jo size 24. They are so comfortable and stretchy and they are high waisted which is always a bonus because then you don’t get the dreaded “double belly” that can happen when the waist band rests too low. This simple outfit is a nice one for this time of year when you may not want a coat or jacket but might feel the need to have that additional coverage for comfort and warmth in this weather. For a evening walk in the park I found this to be a really comfortable wear and it got me thinking that I need to pick up some more jumpers. I thought that I would pair the outfit with my Joe Browns boots from Fashion World. I wanted shoes with a touch of gold and as these boots have studs that compliment the jumper they were an easy choice. My signature hoop earrings and my lovely necklace were also a no brainer as I wanted a simple look with no added colours. 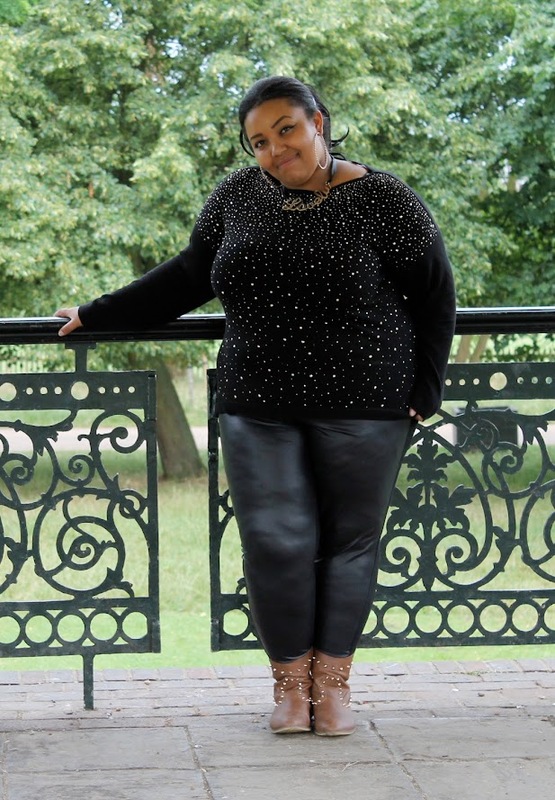 What I really like about this look which I never paid attention to until I looked at these pictures is the fact that from the back it looks as though I’m wearing a plain black jumper and simple leggings. When you see the ensemble from the front there’s loads going on with gold sparkles and the wet look shimmer on the front panel of the leggings. I think when it comes to fashion sometimes the element of surprise can be fun when someone is wearing something different to what you expect lol. Have a look in your closet and see what might work for you during the change in the seasons. Remember whatever you wear, feel fabulous in it and wear it with a smile! When I was recently contacted by Fashion world offering me the chance to put together a look from their Joe Browns range there were several items that really caught my eye in the collection. As some of you know I really enjoy experimenting with different styles of clothing and seeing what works for me in different scenarios. I think when it comes to how we dress ourselves, one of the things we all have in common is the need to have a simple by cute look that allows us to play around with those staple items in our closet. I absolutely love jeans and I enjoy wearing them. For me jeans are one of those items that can either be really fun and dressy or just a comfortable item that we can throw on during those fast paced days when you just need something that will work with whatever events the day may bring. As a long time lover of all things paisley, when I saw the light blue jeans with paisley print I just had to have them. I think my long history with hair scarves and bandanas is what started this mild obsession but I’m happy to say this is one of the few style trends from my teens that I still hold as an adult! Usually I get to wear them with vintage styles but what’s nice is the fact that I can also wear one of my white or blue ones with these jeans if I want to really want to make a thing of the classic pattern in an outfit. When it comes to jeans I will be honest my size heavily changes from brand to brand. I can wear anything from a size 22-26 so when it came to picking these ones I knew I wanted a fair bit of extra wiggle room in the tummy and thigh area. I picked these up in a size 28. I will be honest they are pretty loose on me and I don’t actually have to unzip or unbutton them to get them on. Having said all of that I actually like the oversized feel of this pair, I can pretty much do whatever and feel comfortable. I do however wear a belt with these ones for security purposes lol. I decided to pair these jeans with an old top from Simplybe. The netted material is really comfortable and works really well with a causal look. With accessories I paired the jeans with the studded boots also from the Joe Browns Collection. I tend to wear flats and balerina pumps with my day to day clothes but since getting these boots they have worked well with many of my outfits and they are so comfortable! I got them at an 8E so there is plenty of extra room which is useful if you want to wear a thick pair of socks for comfort. I thought I would keep it simple and work with the blue tones in the jeans for additional pieces in my outfit. I thought this cute bag and cuff from Primark would fare well and some old bracelets I have had for years that I found lying around in my jewellery box. I’m pretty sure that these were a popluar choice with shoppers on the site aswell as many of the other items in the collection so make sure to take a look. There are some really nice bits available at the moment. Recently I was contacted by Fashion World offering me the chance to put together a fun and fresh summer look from their current collection by Joe Browns. When I think summer style; I like clothes that are cute, bright and comfortable to wear that can work for me during daytime and evening events. No matter who you are just the thought of Summer makes you smile. In my case I tend to venture outdoors when the sun shines for a large variety of activities such as long walks, Pimms in the park, beach holidays, fun adventures or just chilled days out with friends. 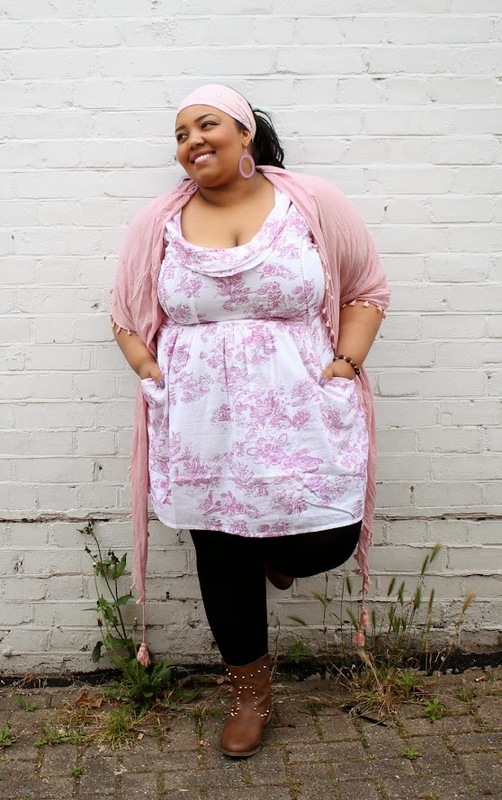 When I took a look through the Joe Browns Collection I really wanted to pick a cute sun dress of some kind and when I saw the sweet style of the Collins Avenue Dress I knew this was something I could wear comfortably and play around with. The pinky/purple tones in a floral/leaf print really suit the season well. I wanted to try a couple of different looks with this dress and I found that by accessorising it I could make it look pretty different. In keeping with the colour scheme I thought it would be nice to drape a pink shawl over my shoulders. I personally feel more comfortable and at ease when my upper arms are covered (we all have those areas we’re not 100% happy with) and as some of the evenings this time of the year still hold a slight chill in the air, I thought this would be a nice way to cover up and stay warm of an evening. Sometimes it’s fun to play around with more dressy, girly accessories and I actually like the look that was achieved in the end. I often don’t go overly girly in my style unless I’m dressing in vintage attire, so I use the summer months as an excuse to bring out the softer side of my personality and I like to express this in my sense of dress. Some girls like to play around with cute daisy dukes and denims during the summer. It got me to thinking, how would a city girl like myself bring in a little bit of country into her style? I like being able to make sweet and feminine dresses more casual in their style. I decided to ditch the shawl and pair the Collins with a cropped sleeveless denim jacket from Forever 21 (several seasons ago size 2xl) to achieve the look. The idea was to bring another dimension to a classic cut and print of dress and have a little fun with it. Overall the dress fits really nicely and just skims over my frame. There are absolutely no tight spots anywhere and an added bonus is the fact that the dress comes complete with pockets. A nice addition if you don’t want to carry anything other than your phone, keys and wallet. There’s a really cute ribbon detail at the back also. The folding neck line is really sweet and enhances the general style of the dress which could lend itself to vintage styles, boho chic, cowgirl and country looks. As you can see by my photos I wore this dress with black leggings. In all honesty the length for this one is fine to wear as a single item; in my case I prefer the additional coverage because my sizeable behind could make the light fabric hitch up a little at the back and I wouldn’t want to showcase my undergarments to anyone lol. As I said I wanted to find a way to bring a little bit of a country edge to the look and initially I was thinking to wear a pair of knee high brown boots but when I saw the Joe Studded Boot In E Fit. I really like the tan colour and gold studded detail. These boots are so comfortable and I thought they really complimented the colours in the dress. In my usual tradition I colour coordinated my outfit with my more playful accessories. In attempt to cover my bad hair day I pulled out a pink bandanna, I love bandannas as an accessory and feel that they can bring a totally new dimension to an outfit. They compliment 50s vintage styles, hiphop styles and have been known to work with many other fashion trends. To complete the look I opted for lilac drop hoop earrings and deep pink lipstick. For more clothes in the Joe Browns Collection click here!